* The most damaging surges appeared to have come ashore in West Hawaii between about 5 a.m. and 7:30 a.m. Friday. It had been predicted the first signs would show up on Kauai about 3 a.m. and the Big Island 20-30 minutes later. However, as scientists cautioned, it wasn’t the first swell that was the biggest. Some areas reported unusual tides and currents for at least 12 more hours. * Kailua Pier is still not condemned. State divers are scheduled to do a structural inspection Tuesday, March 15. If they give the all-clear, the pier will be re-opened. A final decision on Wednesday’s regular Kona cruise ship stop has not yet been made. County crews, led by Mayor Billy Kenoi, swarmed Alii Drive Monday morning. They closed the section of Alii Drive between Kailua Pier and Sarona Road so they could immediately proceed with a temporary paving fix. Rather than prolonging the work for days with one-lane closures, they appropriately decided to close it off to vehicles for the day. 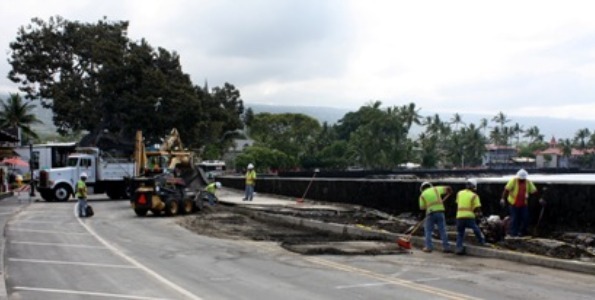 Note that Alii Drive is open for pedestrians. Mahalo to Stanley Nakasone, Ben Casuga and the entire Kona Highways Division! The mayor has been spotted going door-to-door for the past three days to personally update affected businesses. Monday, Hawaii Tourism Authority CEO Mike McCartney and board chairman Ron Williams, along with Big Island Visitors Bureau’s George Applegate, arrived to inspect damages and determine how best they can help. Destination Kona Coast and a group of commercial boat operators and vendors have formed a working group to focus on Kailua Pier. Their urgent goals are safety and immediate restoration of services. A structural assessment of Kailua Pier is to be undertaken Tuesday. Underwater video is being collected to assist in the assessment. Splasher’s Grill is open for business. Some of the shops on the ground floor are experiencing flood-related challenges and they are busy working on them. Electrical power to Kona Inn has not yet been restored. Crews are at work at the King Kamehameha Kona Beach Hotel removing soggy carpet and temporarily enclosing the restaurant. Insurance adjustors were making their rounds. Tsunami survivor shirts have already hit the shelves. Gotta love the entrepreneurial spirit! Hulihee Palace remains closed pending a structural assessment of the landmark this week. Two upcoming outdoor events on the palace grounds are still happening as scheduled. First, this Sunday’s 4 p.m. band concert is confirmed. Also, the annual palace fundraiser, Day at Hulihee, is on for 9 a.m.-4 p.m. Saturday, March 26. Palace caretakers, the volunteer Daughters of Hawaii and Calabash Cousins, have been working non-stop since Friday to dry out the basement and any salvageable contents. Treasured artifacts, which were hastily removed from the palace’s first and second floors prior to the tsunami, are being re-installed into the museum’s extensive collection. Partial electricity has been restored. The main floors of Hulihee Palace were spared the wrath of Friday’s tsunami. While the basement of the palace was flooded, there was no water damage to the first floor of the seaside historic landmark. The palace’s newly renovated caretaker cottage didn’t fare so well. It is off its foundation and the adjacent Kiope Pond, which was used in ancient times by Hawaiian royalty for aquaculture, suffered damage to its walls. “It looks like water came into the pond, surged, and then washed under the cottage,” Au Hoy said. Donations are greatly appreciated and can be mailed to Hulihee Palace, 75-5718 Alii Drive, Kailua-Kona, HI 96740. Puuhonua o Honaunau and Kaloko Honokohau National Historical Parks continue to assess tsunami related damage. Puuhonua o Honaunau and Kaloko Honokohau National Historical Park staff continued to assess damage to park resources, trails, and coastal areas Monday. 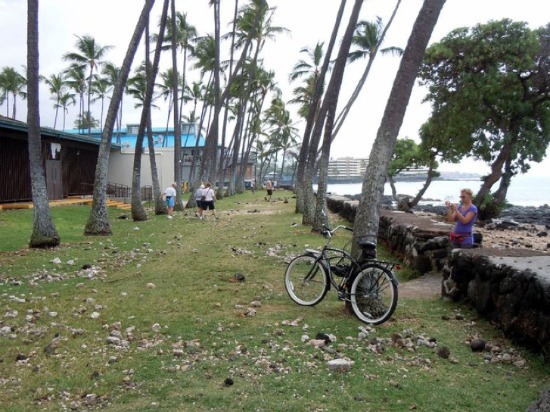 The tsunami came ashore at Puuhonua o Honaunau and Kaloko Honokohau National Historical Parks and entered into the near coastal regions of the parks, over topping walls and surged inland hundreds of feet. National Park Service crews are continuing to assess coastal areas of both National Parks. At Kaloko Honokohau National Historical Park the unimproved road to Kaloko Fishpond remains closed as the coastal trail, picnic and parking area at the pond have been damaged and debris cover the ground far inland. The Hale Hookipa visitor contact station along Queen Kaahumanu Hwy is open 8:30 a.m. – 4 p.m. daily to provide visitors information about the park and safe access paths to the coastal regions. Much of Puuhonua o Honaunau National Historical Park will remain closed as resource crews assess damage to the park and begin clearing debris. Visitors are able to access limited areas of the park including: the visitor center, paved parking area, the amphitheater and the canoe halau from 9:30 a.m. – 4 p.m. The royal grounds, puuhonua, picnic area, coastal and 1871 trails all remain closed to entry. At Puuhonua o Honaunau, the tsunami surges entered the royal grounds and fish ponds throughout the day on March 11, scattering marine debris and coastal vegetation throughout the park grounds. Further information on Park closures will follow as they become available. For further information about the parks, call Puuhonua o Honaunau NHP (808) 328-2326 ext. 0 and listen for closure updates, or Kaloko Honokohau (808) 326-9057 during operating hours. * Keauhou: Major damage still being tallied at yacht club, pavilion and parking lot. * Kai Ehitu Canoe Club reported losing two of its six canoes. The club managed to move four canoes in time, but had to leave two practice canoes behind and they were destroyed at Kamakahonu Beach fronting King Kamehameha’s Kona Beach Hotel. Kai Ehitu is scheduled to host the season’s first regatta May 21 at Kailua Pier. To assist Hawaii residents and their family and friends in Japan after the catastrophic earthquake and ensuing tsunami, Hawaiian Telcom is offering all of its residential home phone customers free phone calls to Japan through April 15. For customers with Hawaiian Telcom Long Distance service, free calling will be retroactive to calls placed March 11. Customers who do not have Hawaiian Telcom as their international long distance provider must call 643-0929 to designate Hawaiian Telcom at no cost, then begin free calling to Japan. Visit hawaiiantel.com/callJapanFree for the terms and restrictions applicable to this program. Also, AT&T is offering free calls and texts to Japan from March 11 to 31. Residential landline customers are also eligible for up to 60 minutes of direct-dial calling to Japan during that time. Verizon Wireless offering free calls, texts and multimedia messages to Japan from March 11 to April 10. And Mobi PCS is offering free calls to Japan through March 31. “We are really going to hurt, economically,” Rep. Bob Herkes said at a talk story Saturday at Ocean View Community Center. The tsunami ran up onto shore at Punaluu before dawn, filling the black sand beach pond with seawater. The waves sucked out, leaving the shoreline covered in debris. At Honuapo, rocks were thrown about and tsunami waves nearly reached pavilions but there was no major damage. O Ka‘u Kakou volunteer Fred Ramsdell said the tsunami changed the look of the beach. “I almost couldn’t tell where I was,” he said. He said some roots of palm trees were exposed. Sand was moved mauka to makai, covering up some of the pools and rocky areas. Rocks and reef are now exposed where they were covered before the tsunami. A few fish were found on the rocks and in the sand. Sen. Gil Kahele hiked Sunday from Milolii to Honomolino, Okoe and Kapua Bays. At Honomolino he reported the tsunami “crunching” two buildings owned by the Carlsmith family and said he was surprised to see a large channel grooved into the beach. Many coconut trees came down, exposing their roots, and half the beach was eroded. Kahele said the wave seemed to come north to south and swept across the peninsula carrying a boathouse out to sea where it sank, with one wall being carried to the shore at Milolii. 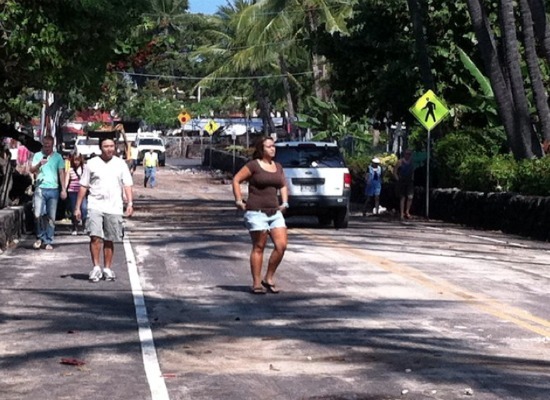 Volunteers were helping to pick up the debris at Honomolino and Milolii. One Okoe house, which was built back from the beach in the kiawe trees, seemed to have been lifted off its foundation, sucked out to the shore and thrown back inland by another tsunami wave. Family and friends were helping the owner clean up. The senator’s son, Kai Kahele, a C-17 Globemaster pilot with the Hawaii Air National Guard, took aerial photos along the coast 15 hours before the tsunami struck. Ka‘u Councilwoman Brittany Smart said people were helping to clean up the coastal area of Milolii, where one side of a building from Honomolino had washed up onshore. She went to Hookena, where she said damage was minimal, and on to Kealakekua, where homes were lost. She said that reefs around the island have been trashed and some volunteer divers are floating bags of rubbish up to the surface where boaters carry them away. Smart reported everything from mailboxes and kitchen sinks to pieces of houses were carried to sea and sank onto reefs in some places. * Four Seasons Resort at Hualalai: Four Seasons Resort Hualalai sustained some debris-related damage in certain areas. As such, we have temporarily closed the Resort and relocated in-house guests while we begin clean-up efforts to restore the Resort to its pristine condition. Ensuring the safety and comfort of our guests is our foremost concern, and in order to do so at our expected level, we determined it best to close while these efforts take place. We plan to reopen the Resort on March 21, 2011. Overall, the Resort sustained minimal damage caused by water and sand from the storm surge, primarily to landscaped areas and the beach. All guests with reservations prior to this date are being contacted by our reservations team in making alternate arrangements. Mahalo and thank you for your understanding. * Kona Village Resort: Kona Village Resort will remain closed until detailed assessment of the grounds have been made as well as structural evaluation. It is our number one priority to ensure safety of both our employees and guests. We are hopeful we can get Kona Village back up and running to full operations — sooner vs. later. However, this will be determined once all reports are evaluated. We appreciate your support and patience until then. If you have reservations over the next few weeks and have not heard back from anyone, you may email monica@hotelvrm.com, who will review with you your current reservations. Mahalo for your kokua. * King Kamehameha’s Kona Beach Hotel: We re-opened the pool and restarted meal service at the Billfish Bar on Sunday morning. All the wet carpet has been removed from the lobby. * Keauhou Beach Resort: It’s business as usual here at Keauhou. The property is full of activity and you are welcome to join in on our many daily activities. The gate to Kahaluu Bay is closed till the county can get in to do repairs. * Mauna Kea Beach Hotel: The Mauna Kea Beach Hotel is doing fine and it is business as usual. We were lucky to escape any damages caused by the tsunami and are thankful there was no harm to our guests or property. We are thinking positive thoughts about those in Japan. * The Fairmont Orchid, Hawaii: The hotel sustained no major damage and has been fully operational as of Friday morning. We thank you all for your concern and look forward to welcoming you to our resort very soon! * Hapuna Beach Prince Hotel: The Hapuna Beach Prince Hotel escaped the tsunami and we are fully operational. We are sending out our thoughts to those suffering in Japan. * Puako is fine. No major damage. * Hapuna Beach State Recreation Area and Spencers were full of happy beach-goers Monday and showed no signs of damage, neither to the facilities nor the shoreline. * St. Peter’s Catholic Church, better known as the Little Blue Church, has not reported any damage. * Sadly, Kahaluu Beach Park did get clobbered and is closed until further notice. The beach and park were badly damaged during the tsunami. Most of the picnic benches in the pavilion were dislodged, the pay phone ripped away and rocks were strewn all over the beach. Once county crews are sure the park is safe, the community will be invited to help with the clean up.